368 pages | 11 Color Illus. | 18 B/W Illus. This book presents several pre- and postharvest strategies that have been developed to modify these physiological activities, resulting in increased shelf life. The book also discusses the best technologies that positively influence quality attributes of the produce, including senescenal changes and, afterwards, the consumers’ decision to purchase the product in the marketplace. With contributions from experts with experience in both developed and developing regions, the book includes chapters covering thorough discussions on postharvest management strategies of fresh horticultural commodities. Recent Advances in Postharvest Cooling of Horticultural Produce. Posthavest Handling and Storage of Root and Tubers. Postharvest Management of Commercial Flowers. Postharvest Management and Processing Technology of Mushrooms. Gibberellins: The Roles in Pre- and Postharvest Quality of Horticultural Produce. Advances in Packaging of Fresh Fruits and Vegetables. Fresh-Cut Produce: Advances in Preserving Quality and Ensuring Safety. 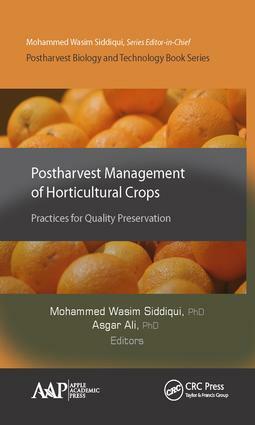 Postharvest Pathology, Deterioration and Spoilage of Horticultural Produce. Natural Antimicrobials in Postharvest Storage and Minimal Processing of Fruits and Vegetables. ENHANCE: Breakthrough Technology to Preserve and Enhance Food. Index.